WAIPA IN REAL LIFE: MY AWESOME TRIP BACK HOME TO BIG ISLAND, HAWAI'I - PART 03!!! MY AWESOME TRIP BACK HOME TO BIG ISLAND, HAWAI'I - PART 03!!! AFTER A WONDERFUL & BEAUTIFUL SATURDAY EVENT IN KONA & WAIKALOA, IT WAS TIME TO HEAD BACK TO HILO AS I WAS ALREADY MISSING MY OHANA!!! BEFORE I HEADED BACK, I STOPED AND SHOPPED AT COSTCO'S. YUPZ... I INVITED THEM OVER TO KEAUKAHA TO MEET MY OHANA!!! 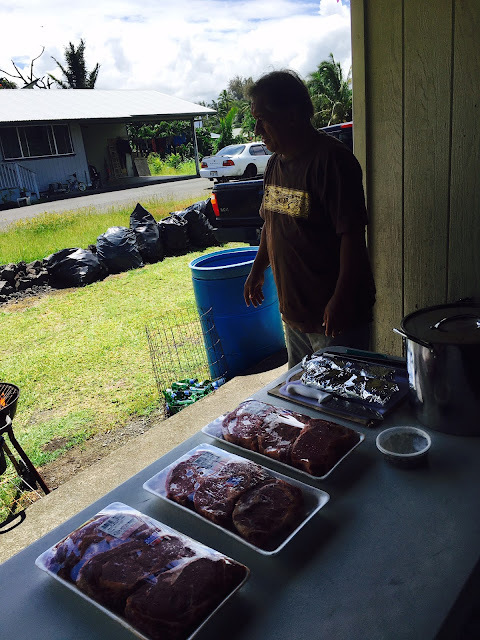 RIBEYES STEAKS, PORTUGUESE SAUSAGES, ASSORTED POKES, DAD'S POTATO SALAD, AND RICE!!! KAHEALANI ANXIOUSLY WAITING FOR THE WILLIAMS OHANA. LEMONGRASS & GINGER BEER... PRETTY DAMN GOOD!!! THE WILLIAMS OHANA HAS ARRIVED!!! THIS BY FAR WAS THE BEST PART OF MY ENTIRE TRIP, UNITING TWO WONDERFUL OHANA AS ONE!!! I WAS SO HAPPY TO HAVE THEM MEET MY DAD AND THE WAIPA OHANA, I WILL FOREVER REMEMBER THIS DAY!!! THANK YOU, MOM, DAD, LEOLANI, GINGER, AND KAHEALANI FOR HOSTING AN AWESOME BBQ DINNER FOR MY OTHER OHANA FROM BETHEL, ALASKA!!! I CAN'T WAIT FOR ALL OF US TO MEET AGAIN, HOPEFULLY SOON!! !